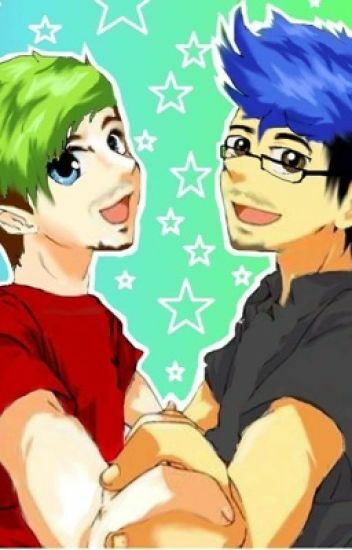 And this is just a fan fiction..
And i know we all hope mark and jack get together but yeh! slowly jack falls in love with his babysitter mark... as time goes he starts a YouTube channel... and I think you already know that...and now they are both living a happy life together.. Okay this is still going but it's almost over! I am DaFoxGameZz and I hope you like this! Mark is a teacher and jack is a student, mark takes jacks phone and curiosity kills the cat as they say, he looks threw it shocked to see the bubbly bright jack wasn't anything he seemed and he really was depressed and terrified, what will happen next..? Read to find out! Mark lives with his father who is very wealthy beacause he a king. Mark's father met Jack's mother and is getting marry. Jack is an artist and sometimes hides his personal drawings. What will happen when Mark finds Jack's personal drawings? Jack is a shy teenager who moved to America with his father and pet Septiceye Sam. He's to shy to make any friend (except for Cry) and he's bullied at school for it. Jack shuts out the world and is to afraid to speak ,until a very popular boy named Mark tries to breaks his shyness. What happen when Jack starts to fall for Mark, and Mark turns against him? Can Jack deal with this after everything that happened in Ireland? Sorry this is my first fan fiction so it may not be good. Jack's been keeping a few secrets from Mark and his other friends. Barely anyone knows. One major secret is his love for Mark. He felt this way for years. The problem is that Mark has girlfriend. Jack doesn't like her and she doesn't like Jack. She out to get Mark not to be friends with him anymore. Jack's other secret is his favorite hobby. Dancing. Can he hide all his secrets from Mark and win his heart? Or will the two boys friendship end? Jack remembers everything from his "dream". When he is put in a foster home, he meets Felix, Bob, Wade, Tyler, Ethan, and Mark?! Jack tries to get Mark to fall in love with him so his dream could come true. He tells the group about the dream he had and Mark starts remembering some little things from the dream but is straight so he doesnt like Jack that way. Soon Mark realizes his love for Jack but it causes more problems then they planned. He smiled, something about him so was bright and.. Astonishing to me. I blinked slowly, and he asked. "Did you want any help, Mr. Fischbach?" His tone was smooth and he sounded so wonderful. I couldn't say anything. Hello friends! Welcome to my book, thank you for coming. Before reading I suggest gazing over the warnings and topics that this story will contain. Thank you for taking the time to read this! If you want to know why or why not I do things go ahead and check out my profile where I talk all about my writing "styles" thank you! All characters depicted in this book are in of themselves, fiction. Even if they portray similarities to real life people, the relationships and characters themselves are of my own design. Jack starts his junior year of high school, and on the first day spots a quite handsome boy. Jack later figures out this "boy" is his fifth grade bully. Who knows what'll happen?